NEWPORT BEACH — An inadequate lookout probably played a key role in causing a racing sailboat to crash into an island during a California-to-Mexico yacht race, killing all four people aboard, according to an independent review panel appointed by US Sailing. The yacht Aegean likely was on autopilot when it motored straight past a GPS waypoint and smashed into the tip of North Coronado Island off the Mexican coast in the pre-dawn darkness of April 28, according to the panel’s report, which was released Oct. 30 by US Sailing, yacht racing’s national governing organization. That waypoint would have been the place where the captain would have decided on which side of the island to pass. Race rules permit the cruising classes to motor between the hours of 8 p.m. and 8 a.m. and a penalty is applied against the corrected time of the boat. 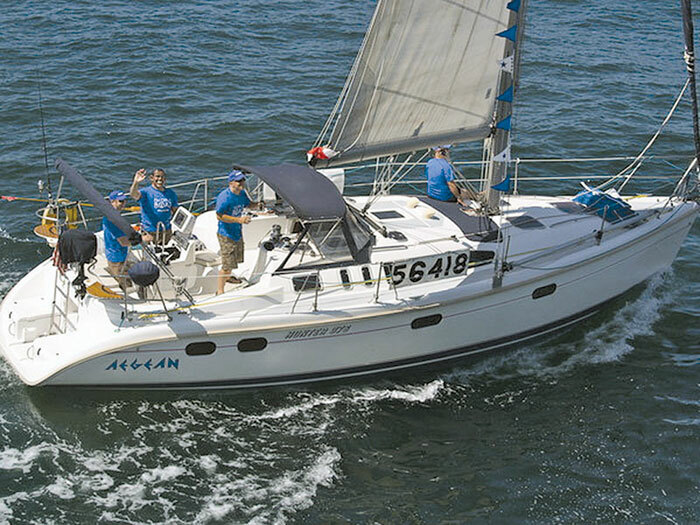 The 37-foot vessel was taking part in the 125-mile Newport-to-Ensenada race when it ran aground. The accident killed the captain, Theo Mavromatis, 49, of Redondo Beach, and crewmembers Kevin Eric Rudolph, 53, of Manhattan Beach; William Reed Johnson Jr., 57, of Torrance; and Joseph Lester Stewart, 64, of Bradenton, Fla. They were the first deaths in the race’s 65-year history. No distress calls were made before the accident and Aegean cruised along at a consistent 7.1 knots for nearly four hours before the crash, according to the panel. Coroner’s reports indicated no evidence that alcohol, drugs or carbon monoxide poisoning played a role in the crash, the US Sailing report indicated. The vessel broke up after the collision. It was so thoroughly smashed that race officials originally believed it was destroyed in a collision with a larger ship in the middle of the night. The report also said that two navigation lights on neighboring South Coronado Island couldn’t be seen from Aegean because they were blocked by the island chain. Aegean did not have an emergency radio beacon or a life raft but a partially inflated dinghy was found in the debris, the report said. The four sailors were found without life jackets, although one was wearing a safety harness, the report said. Among its safety recommendations, the report suggested that racers always have at least two people per watch to maintain a proper lookout and those vessels should be equipped with audible waypoint and radar alarms. According to the report, unless it is overridden by manual intervention upon reaching a waypoint or end of a route, the autopilot software aboard Aegean would direct the vessel to continue on the prior course. It also noted that radar guard alarms were not set as a standard practice by race participants because of the high number of targets encountered during the races. The panel said it relied on available facts to create its report as there were no survivors and no eyewitnesses to the accident. The facts, it said, included the SPOT connect (GPS tracking device with text capacity) position reports from which vessel course and speed were derived, times of the SPOT connect text transmissions during the race, published material, press reports including accounts of the San Diego Coroner’s report and the results of their toxicology analysis, interviews with race organizers, participants and past crew from Aegean, wreckage found at North Coronado Island and in the debris field and underwater at North Coronado Island. The panel was formed and the report was issued to give US Sailing insight into how to avoid similar accidents for future races. An official report from the Coast Guard has yet to be released, as it continues to investigate the accident. The members of the panel are chairman Bruce Brown (Costa Mesa), John Winder (Annisquam, Mass. ), Alan Andrews (Corona del Mar), Ed Adams (Middletown, R.I.), and Alan McMillan (Pensacola, Fla.). The Offshore Special Regulations Consultant on the panel is Evans Starzinger (Milford, Conn). The Safety at Sea Committee Chairman and Review Panel Liaison is Chuck Hawley (Santa Cruz). The Medical Advisor was Dr. Steven Shea (Long Beach). Jim Wildey (Annapolis, Md.) advised on investigation procedures and formats. The entire 119 page report by the review panel is posted on the US Sailing website, at ussailing.org. — Reports from the Associated Press and The Log News Service were used in this story.